This is my fourth post about our holiday in Malta in early September and I’ve decided to do it in two parts. Both posts will be about the lovely island of Gozo, which we visited on the Wednesday of our week. Gozo is the second largest of the three main Maltese islands, and just a 25 minute ferry crossing away from Malta – or 15 minutes by seaplane. The island has been described as ‘Malta’s prettier little sister’ because it’s greener and more rural than Malta. Gozo also boasts an impressive number of historical sites and cultural events and has still-thriving agricultural and fishing industries. The island has long been associated/equated with that of Ogygia, the home of the nymph Calypso in Homer’s Odyssey. The story tells of how Calypso – who possessed supernatural powers – fell in love with Odysseus, holding him captive for several years before releasing him to continue his journey home. 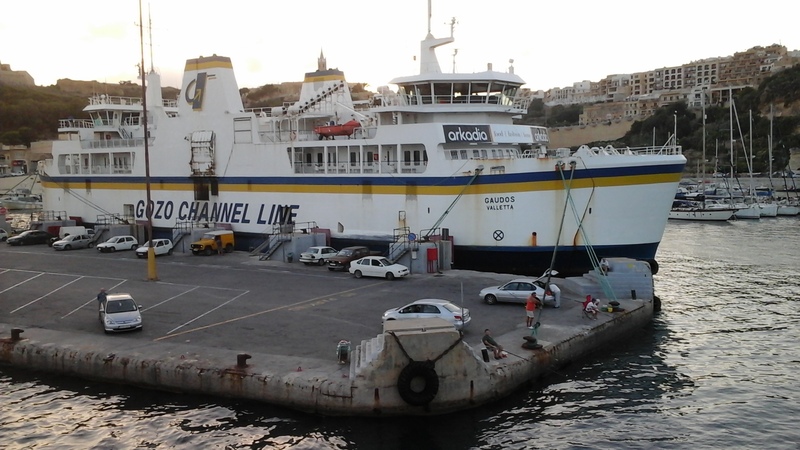 Our day involved a guided tour, for which we were picked up by coach from our hotel in Bugibba and taken to the ferry port at Cirkewwa on the north-west of Malta to make the short ferry journey over to Gozo with the The Gozo Channel Line. 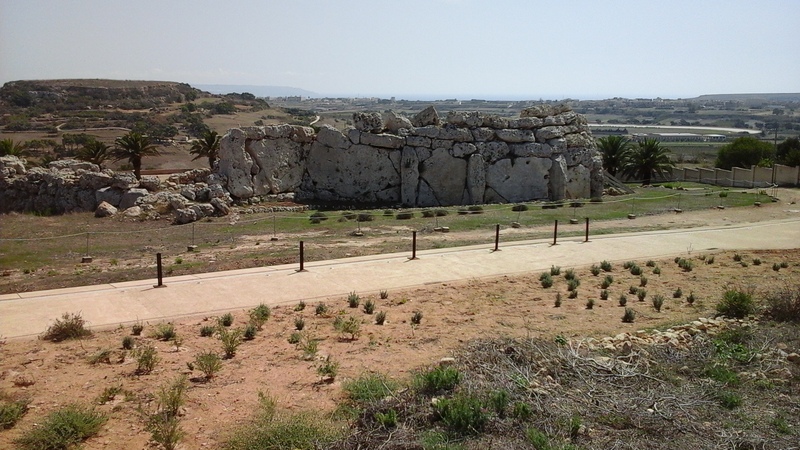 At the port of Mgarr on Gozo, we boaded our next coach and our first stop was the most famous site on the island: the Ggantija Temples at Xaghra. Ggantija consists of two separate systems of courtyards, not interconnected, known as the South Temple and the North Temple. The South Temple is the bigger and earlier (3,600 BC) of the two, the North Temple being a later addition (c. 3,000 BC). The North Temple has a five-apse structure, the South Temple has four. 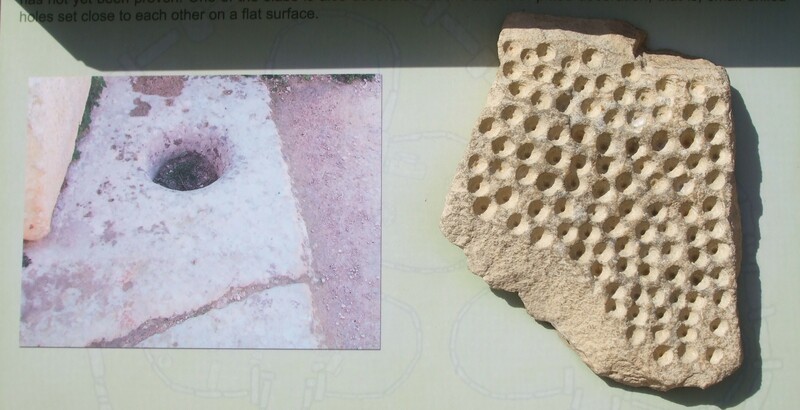 The stone spheres (top right photo above) were thought to have been used as a method of moving the great slabs of rock. The entire temple complex was built out of two types of rock: the harder Coralline limestone for the outer walls and the softer, golden Globerigina for the doorways and floor slabs -though some of the floors were just covered with beaten earth (torba). 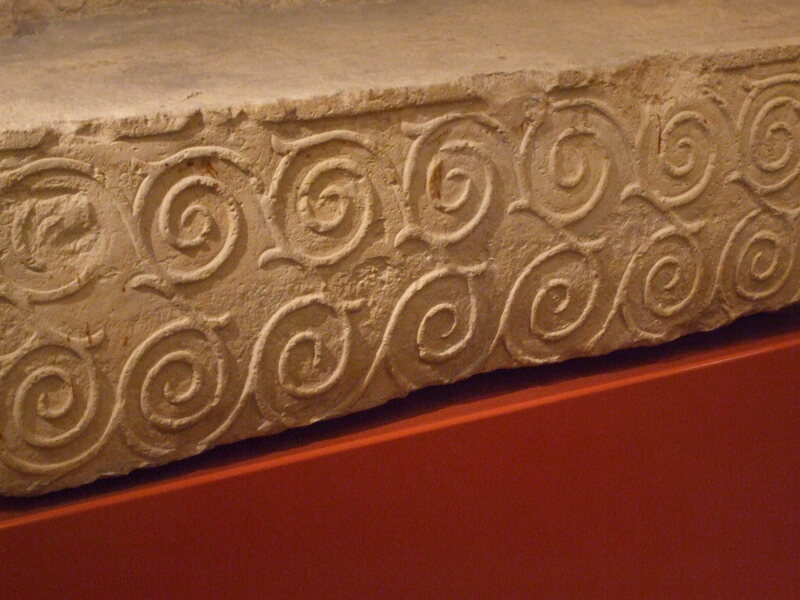 At Ggantija, the spirals can now hardly be seen, although they were visible when the temple was discovered in 1826, suggesting there must have been a roof of some sort to preserve them. 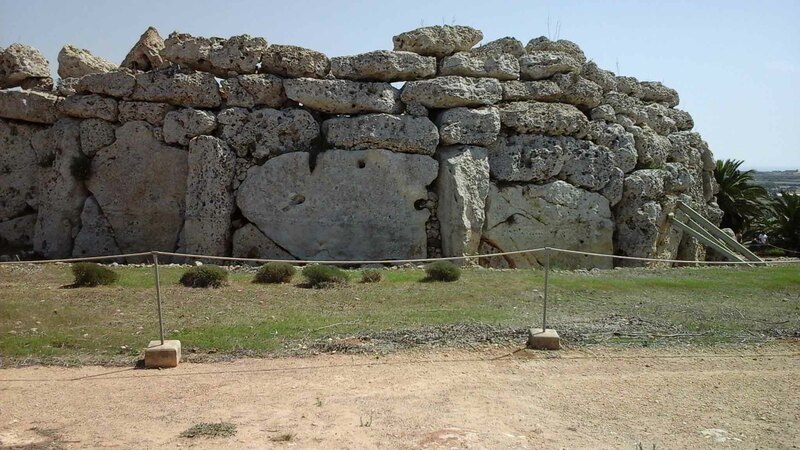 The huge megaliths of the outer wall were positioned alternately, one vertically and one upright, and the space between the outer and inner walls is filled with earth and rubble. It is thought that it was this that has given Ggantija the stability to survive 5,000 years. In the South Temple, the great court measures twenty three metres from apse to apse and the walls here are eight metres, the highest of all the temples. Arches weren’t used at this period, and since the span of the apses was quite large for any stone roofing to be used, it is thought that the roofing material would have been wood or animal hides. 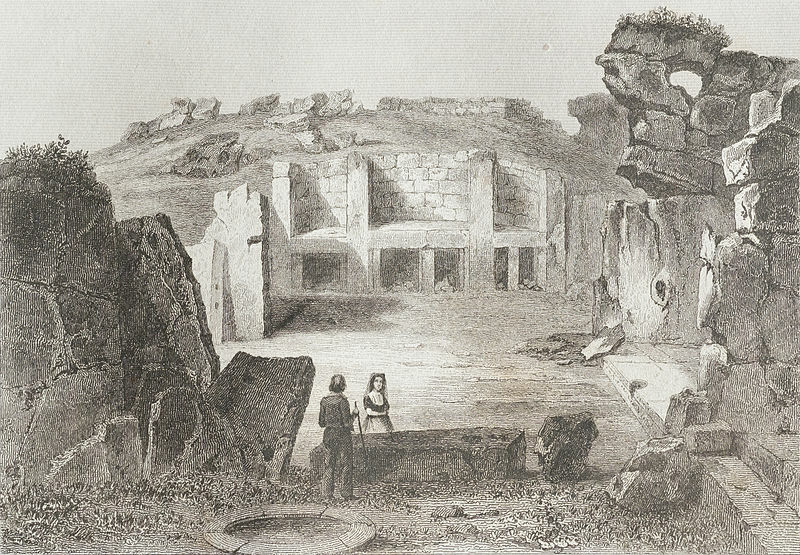 Engraving of the Ggantia megalithic temple in Gozo made in 1848. Title: ‘Gozo (Giants’ tower)’. Photographer: Marie-Lan Nguyen (2013). Public Domain. On each side of the door leading into the temple are hollows carved opposite each other on two large megaliths (two pictures in the gallery above – second and last rows). It is thought that these held some sort of barrier – a door or a bar, perhaps both at different times – to close the entrance. the megalithic structures are amazing! It looks like a rich and lovely place to visit! you cover everything so beautifully and it is like having your own personal tour! I love the pictures and the link to the Odyssey! Very interesting! I just love this post and wow would love to go now!! the prettiest of the three sisters!! Fascinating. Such old structures. Nice, milliethom. So interesting! I find myself trying to fill in the gaps to imagine what the temple might have looked like when it was still complete. The floor plan is new to me, but I notice Wikipedia says it’s the “typical clover-leaf shape ” Hm, learn something new every day! Hi Millie. It looked like you had an amazing and inspirational visit to Malta. This is on my places to visit too. There is a lovely fictional book by Caroline Smailes called ‘Like Bee’s to Honey’, which is located in Malta. It might make a good read now that you have a sense of the place. We’ve been to Malta five times now. We bought a time share there in 2001 when we were on holiday there, but don’t use it every year . 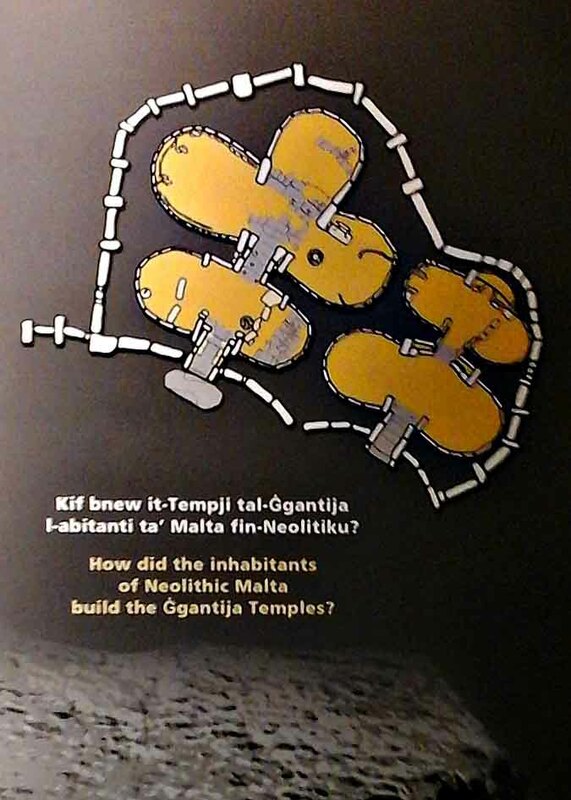 The title of that book is so appropriate for Malta. 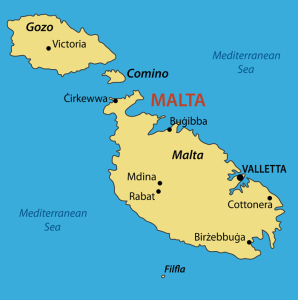 The Romans called the island Melita – which means honey. I’ll certainly have a look on Amazon! Thank you for that, Donna. Wow, Malta must feel so familiar to you know. How lovely that you have been there five times. There is so much history, and it is intetesting to find out about the word ‘Melina’ – now the title makes really does capture it. Have a great day. Best Wishes! Hi Millie. No I haven’t been away. My approach to blogging is to post only when I feel I have material to post; rather than feel that I have to post all of the time. The best part of that is that the posts that I do put up get exposure for longer than they would if I was to post constantly. I also post on my FB author page and Twitter as I’m hoping to build a following for when I send to publishers or need to market my book – eventually! I think it is always ok to take a break and to not feel pressured by writing…I think that’s why FB snd Twitter are lovely little ‘fill-ins’. Have a great day! I hope your book is coming along very well. At least you’re doing things the right way (unlike me) and bulding up your author ‘platform’ first. I have a Twitter account and a FB page – both with hardly anything on them. I suppose I ought to get my act together, sometime. Thank you, Millie. Yes my book is something that seem’s to be growing in my head more than the paper…but it is a fun process thinking ways through the plot…and hopefully soon I can start to put together the chapters. I must admit, it is time consuming keeping up with all of the social network sites but I have got a thing set up whereby you can post on FB page which auto-feeds to Twitter…also posting on WP can also auto-feed to FB and Twitter…great little tricks! I hope your writing is going well…you certainly have a good following and you post some wonderful posts 🙂 Speak soon. You are giving me some wonderful ideas for my own island: libation pools, obscenely old graffiti, styrofoam megaliths, preternatural nymphs in diaphanous robes abducting travelers nolens volens… Three is so much for me to learn from this farrago of ancient ways. Unbelievable! Very impressive. Thanks for all this information. It must be worth it to wander around and imagine all the things that had happened there. Visiting places like those needs at least two or three days to absorb everything. It does, but unfortunately that’s difficult when you’re in the country only for a week. But if we go to Gozo again, we’ll go on our own, not on a guided tour. I could have strangled that guide. She didn’t even give us time to look at the rooms with all the information about the temples. We scarcely had time to look at the temples themselves. Still, Nick managed to photograph several information boards for me on the way back to the coach. It is so sad/bad that these guides are always in a hurry to show as much as they can and then as fast also. It is the best to go on your own and then take time to go where you really want to go. We’ve had some guided tours that have been really good. When we went to Andalucia in May, the whole trip was a guided tour, and it was excellent – but it was with a well known company. This one was just with a local Bugibba group, and not well organised at all. Still, we bought our own information books and took as many photos as we could. I see! When a guide is well organized It is a feast to have them. Also usually worth using a well known one helps. The last tour I had visiting the Kruger Nat park was an excellent guide. We did a night trip. He knew before hand where some rhino and buffalo were and on top of it we saw a leopard been chased up a tree by hyenas. Was worth it. You’re right. I all depends on the skill of the guide. We had a similar trip to your Kruger National Park one. We had a safari holiday in the Masai Mara, and those guides were like yours – they knew exactly how to run a trip. This woman on our Gozo trip gave us little information and what she did say she glabbled so fast, no one understood her. Seeing a leopard chased up a tree by hyenas must have been fabulous. Did you manage a photo, or was it all too fast? Great memories, anyway. It was a great adventure. I did not take photos because I only had a “small” camera and you could not use a tripod because we were sitting on the open jeep. Ha ha, Thinking about it also made me smile because the jeep was full of :Oooos and aaaaaas when we saw this in the spot light. It must have been fantastic. We didn’t manage to see a leopard, although we were told there were some out there. It was very special because usually leopard are nocturnal and not seen that often. Wow, this is really incredible. Those structures are amazing and older than the pyramids too! I think it is also interesting how people had the capability to build these so very long ago when we must have so many tools and heavy equipment to build basic shopping centers now. Great post! I agree, it’s mind-boggling. I felt the same about Stonehenge until I read about possible techniques. The novel, ‘Sarum’ also describes the building of Stonehenge. The pyramids are awesome. I’ve never seen them for real. We did a cruise down the Nile a few years ago, and visited many of the temples, like Karnak, Luxor and Abu Simbel. How they were constructed is also incredible. Fascinating! I can’t believe the temple’s older than the pyramids! Love the spiral decoration, too. Must be very interesting seeing ancient history with your own eyes. Have you been to the Egyptian pyramids, btw? (I haven’t) What about the temples in Athens? Marvelous place, myths and history of humanity all tangled together. Thank you for this post, it makes me think of visiting Malta myself. This area is so rich in history! I am not a beach person, and I would love this kind of trip. You have been there five times – I will see only basic touristy things if I go just once… It is why I am so grateful for people like you who share their experience with others. Hi Lyn.I’m getting to know Malta quite well now, having been there five times! We still have quite a few sites to visit, though, and next year we plan to have another ferry-ride up to Sicily. We got up to see Mt.Etna last time. Your list of places to visit sounds ver similar to ours! Amazing history Millie. Were you able to touch the walls or were they too fragile? Most walls we could touch, a few were in roped off areas. They didn’t look too fragile, really. The stone has withstood the 5000 very well!